Don’t you hate it when for no particular reason (that you can pin point anyway), your skin starts to act up and you start breaking out. And it just always seems to happen at the worst of time - whenever you want to look your best without any angry red spots calling unwanted attention, giving rise to anxiety and frustration. Unfortunately, I recently had (and am still having) this very problem with a break out on my chin and around the jaw line. 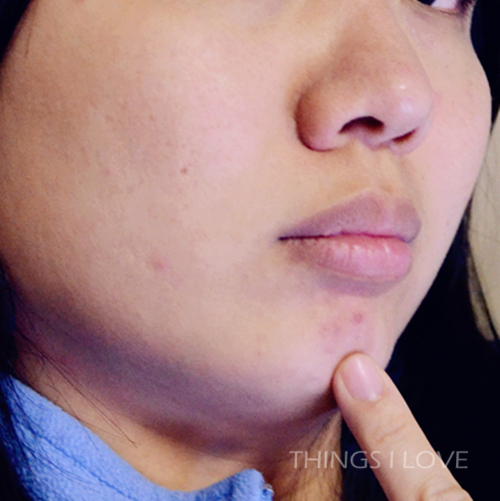 I normally don’t get pimples in this area and couldn't pinpoint it to a particular reason be it related to stress, bad diet, or hormonal (as those generally triggers a break out on my cheeks). Needless to say, it's annoying and frustrating to suffer a break out. So out came all the acne blemish treatments and skincare regime in my attempt to regain my clear chin again. Following the guideline of Treat, Heal and Prevent, here’s a breakdown on how to say good bye to break outs, keep them in check and hello to clear complexion! If it’s an angry outbreak, then treatment products can either stop the offending pimple from developing if caught early or if it's beyond that point, speed up its cycle so it can go away and heal quicker. Another treatment I like is Clearasil Ultra Vanishing Acne Treatment Cream Extra Strength (20g A$14.49) containing 5% benzoyl peroxide to kill bacteria as well as dry out the pimples, quickly banishing spots. Those with sensitive skin types might find it too strong as it can irritate skin or cause stinging sensation so bear that in mind and try the normal strength product or use every other day only. 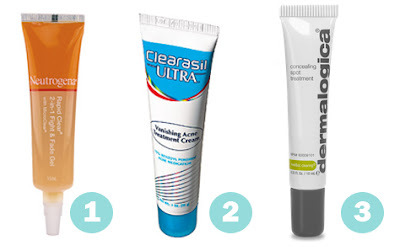 Dermalogica Spot correcting treatment (10ml $35) is my preferred day time spot treatment as it doesn't ball up and has got a natural beige tint to help conceal any redness and dark marks. It also contains 5% sulphur and zinc oxide as active ingredients to help fight and clear those pesky break outs. When treating active pimples and acne, you need moisturising and soothing skincare as acne treatment products can by drying on skin. You want to look out for products that moisturise, help fade scars and speed up the recovery of healing skin. 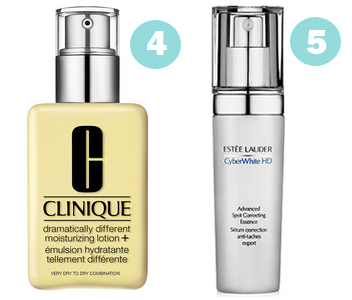 Since treatment gel and creams often leave skin dry and tight, it’s important to use a hydrating moisturiser like the newly reformulated Clinique Dramatically different moisturiser Plus (50ml A$29 or 125ml A$49) containing sunflower seed, cucumber and barley extract to improve the skin barrier function and urea, hyaluronic acid, glycerine to increase moisturisation levels during the day. I like that it's non irritating so even sensitised skin will feel immediately comfortable with this great moisturiser that also gives soft silky skin. To fight and fade off marks and scars, I've found Estee Lauder CyberWhite HD Advanced Spot Correcting Essence (20ml A$140) to be invaluable in reducing the appearance of scar marks on my chin. In fact, anything to do with pigmentation, whether from break outs or sun exposure, it has to capacity to correct and repair fresh dark marks over the course of 6 weeks. My marks from break outs are lighter and fading away by the day. I also notice that it gives my skin a translucent glow as it gently accelerates skin cell turn-over to improve skin clarity. Win-win! Good skin starts with daily washing and facial washes can go a long way to helping keep skin clear. Here are some of my cabinet staples during periods of break outs. Products that contain salicylic acid like Neutrogena Oil Eliminating Foaming Cleanser (150ml A$13.99) are not very effective in removing dirt, oil and dead skin , they reduce the chance of blocked pores. I love how this cleanser leaves skin with a velvety texture after washing, is non-drying and not too harsh. Afterwards, I noticed that it also helps to provide a couple of hours of shine control so I don't oil up as much. 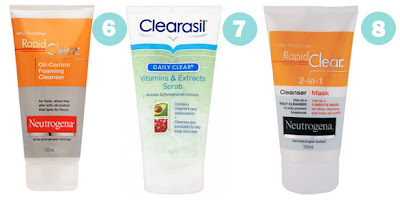 For scrubs, the recently released fruity smelling Clearasil Daily Clear Vitamins & Extracts Scrub (150ml A$10.99) has avocado and pomergranate extracts to sooth and nousish skin whilst the salicylic acid and micro-bead scrub is effective with manually removing dead skin cell and grease build up whilst leaving skin feeling smooth and gently cleaned. For a little something extra, the Neutrogena 2 in 1 Cleanser Mask (150ml $13.99) is handy as you can use it two ways- as a normal daily cleanser or as a face mask. Every other day, or when I have a new break out, I would apply a thin layer over it as a mask , wait 5 minutes and then wash off to absorb excess oil and help soften skin and sooth the pimple. The clay-based mask cleanser is also great for reducing pesky blackheads as well as it also contains salicylic acid to dissolve and dislodge dead skin cells. After 6 weeks, I'm still not out of the woods with my break outs. I do however, find that the pimples take only a few days to heal rather than the full week. Now if only I can stop new ones from forming, I'll be on my way to clear skin again. I've also increase my intake of fresh seasonal fruit (strawberries are in season right now) and drinking plenty of water helps flush out the toxin and clear the break outs quicker. I think I'll need to add an exercise regime as the final process to help to rid toxins out of the body quicker as well. If you are suffering a break out, give these products a try and I hope they work as well for you as they have for me. This review features products provided for consideration but I've previously purchased and will continue to buy the above acne treatment products to help me get rid of my break outs.